Bob Hogeboom devotes his practice exclusively to insurance regulatory, corporate, legislation/adoption of regulations and administrative matters before the California Department of Insurance (CDI). Mr. Hogeboom represents numerous insurer and producer clients in regulatory and administrative matters including market conduct claims and rating issues. He has handled more than 50 hearings involving CDI enforcement actions against insurers and producers including rate hearings, market conduct actions and disciplinary proceedings. 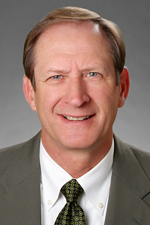 In addition, Mr. Hogeboom serves as outside special counsel to several producer trade associations and serves as the firm’s liaison to the Association of California Insurance Companies and special counsel to the Pacific Association of Domestic Insurance Companies. Mr. Hogeboom became a partner at Hinshaw & Culbertson LLP in October 2014 as a result of the merger of Hinshaw and the Los Angeles-based firm of Barger & Wolen LLP. "PacifiCare One Year Later: The Controversy Moves to the Courts," at the Twenty-Sixth Annual Association of California Insurance Companies (ACIC) General Counsel Seminar July 22, 2015. "Torchmark Rulings Provide Framework for Successful Defense of California Insurance Trade Practices Actions," Claims Journal, September 2016.